Medium: L26.5 x W19 x H8.5 cm approx. Small: L22.5 x W16.5 x H7 cm approx. 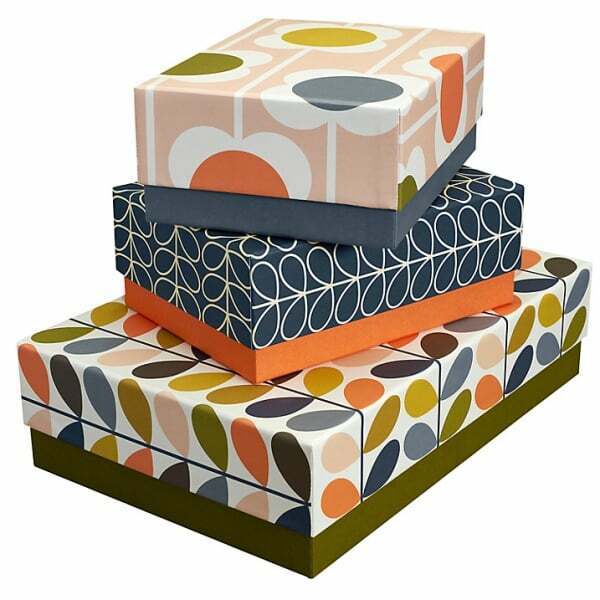 This colourful and eye-catching Set of 3 Orla Kiely Storage Boxes in Assorted Flowers designs will make a stylish and useful addition to many homes and offices. Featuring Orla's iconic Multi Stem, Linear Stem and Abacus Flower patterns, the set comprises one small, one medium and one large box which nest inside each other to save space when not in use. Showing our 2 Orla Kiely Assorted Flowers Storage Boxes - Set of 3 reviews with an average rating of Excellent. Would you like to write a review? IF you love Ola this is for you! Bought as a present for a friend who likes Orla Kiely. The boxes look lovely and feel like good quality . Delivery was quick too.